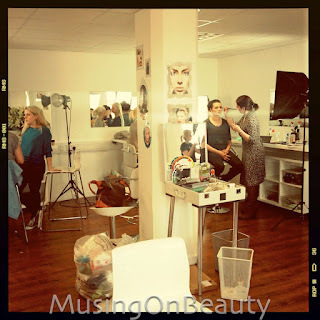 Musing On Beauty: A week at Pixiwoo Makeup School - in details. Pictures of my week were posted here. So I thought that I would give you more details on what's happening behind the walls of the Pixiwoo makeup school, as some of you might be interested in taking that kind of course. You don't really need any experience as a makeup artist to follow this course. The group was relatively small -12 people- which means that everyone gets the attention and help that they need no matter how much that is. In our group, 8 people were beginners and 4 were already working and a bit more advanced. Those people sometimes got different assignments so that they wouldn't lose time practicing techniques they already knew. If you don't live in the UK, that shouldn't stop you as long as you speak English. Our group was the most international one ever with people coming from France, Italy, Scandinavia, Russia and even the US. Only 4 people were from the UK. Classes were starting at 10AM and ending between 4 to 5 PM, with about an hour of lunch break. For every theme we worked on, Sam or Nic gave us a demo and detailed explanation. We could ask as many questions as we wanted. They also shared stories and experiences from their career and it really makes you realize that a makeup artist can be asked to do a lot of things and should be carrying around a ton of stuff! The studio is full of books and magazines, so inspiration pics were featured as well. The themes we worked on. On day 1 we started with the basics and did a no-makeup makeup look, which makes you work on creating a flawless base. After that we had a blending exercise that consisted on doing a full face with black and white eyeshadows only. This teaches you not only how to blend (Mac Carbon, you're a b!tch) but also where to put shadows and light - so this is basic knowledge to acquire. On day 2 we finished the black/white exercise and then did bridal makeup, and as several people in the group were willing to work on that field, we spent some time on it. It also allowed us to discuss skincare and skin prep, which are quite important on that kind of job. On day 3 we talked about period makeup, starting with the 20's and going through each decade. This is particularly important as right now, the trends are a mish mash of past decades and nothing really innovative. Also, if you plan on working on photoshoots, era's will constantly be referred to when you get a briefing so you need to know them well. We were also given advice on good books to get for inspiration. On day 4, we had to be creative and did drag makeup. This allows you to go crazy with colors and textures but also to learn how to block brows (that is no piece of cake, I'm telling you) and to use stencils to draw shapes on the face (much more funny and easy). Day 5 was more à la carte. We asked about male grooming as there was a man in the group, so he was used as a model for a demo. Then we worked on brows and lipliner as several of us were struggling with those particular techniques, and we ended with a 5 minutes smokey eye demo. We then practiced for the rest of the day. How did I like this course and would I recommend it? First of all I need to tell you that Sam and Nic are really lovely, they definitely know their job and they're very helpful and encouraging. The first hour there, you might feel like you're in the computer now, but there's really no reason to be nervous or intimidated. They are real woman working to make a living, just like every one of us, and they are fantastic teachers. 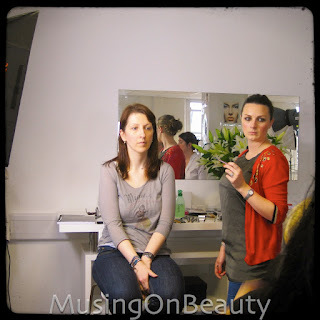 I do believe that this course is great even if you are a complete beginner and you have never applied makeup on anyone. What is helpful, though, is a bit of knowledge about products, as the mass of products available to use during the course can be overwhelming, so if you are well informed, it makes things easier. Mostly Mac products are used - especially for foundations-, but not only. You'll get to try a wide variety of things. You will see that your confidence and skills improve rapidly, and that after a couple of days, putting your hands on someone's face to apply makeup starts feeling natural and easy, while it can be very intimidating on day 1. However, let us face it: you won't get out of that course knowing it all once and for all. I would even say that you will only realize then how much practice you still need and how much you can still learn and improve. This course is just a starting point, it will give you the basics and the technique, then practice will make it perfect. But I would insist that practicing on your own face is not going to be enough and that after your course, you'll need to practice as much as you can on other people - friends, sisters, family... every occasion is a good one! Let me know in the comments if there are any questions you'd like me to answer! EDIT : For any information on upcoming courses, please follow Stacey on Twitter @PixiwooHQ or like the Pixiwoo Course Facebook page. As far as I know, 2012 courses are fully booked but 2013 dates should be announced soon. Be quick if you want to get a spot! love this, thank you so much for sharing - I'm so excited already, can't wait for September to come when I'll be among the students. did you get some kind of certificate confirmung you took the class? Hi! Yes, you do get one indeed. I wish you a lot of fun with the class of September, you guys will be working in the new studio! This sounds like an awesome experience! How fun! This course sounds incredible! I heard that all 2012 classes are fully booked and i'm gutted! Would it be possible for you to tell me exactly how you applied for the course as i am interested in doing it myself! I would be ever so grateful! Well the thing to do is to follow Stacey on twitter (@PixiwooHQ) and/or the PixiwooCourses facebook page, as the courses for 2013 will be announced there. As I wanted to go with 2 girlfriends, we had to find 3 spots, so we booked as soon as the 2012 classes were announced (back in October last year I believe) and we were prepared to accept any other group if May had been fully booked. You definitely have to be quick! Wow - this is a dream for me. How amazing you had the opportunity to work with 2 of the most influential and talented ladies in the MUA/Beauty industry! How much was the course. I would love to do it. 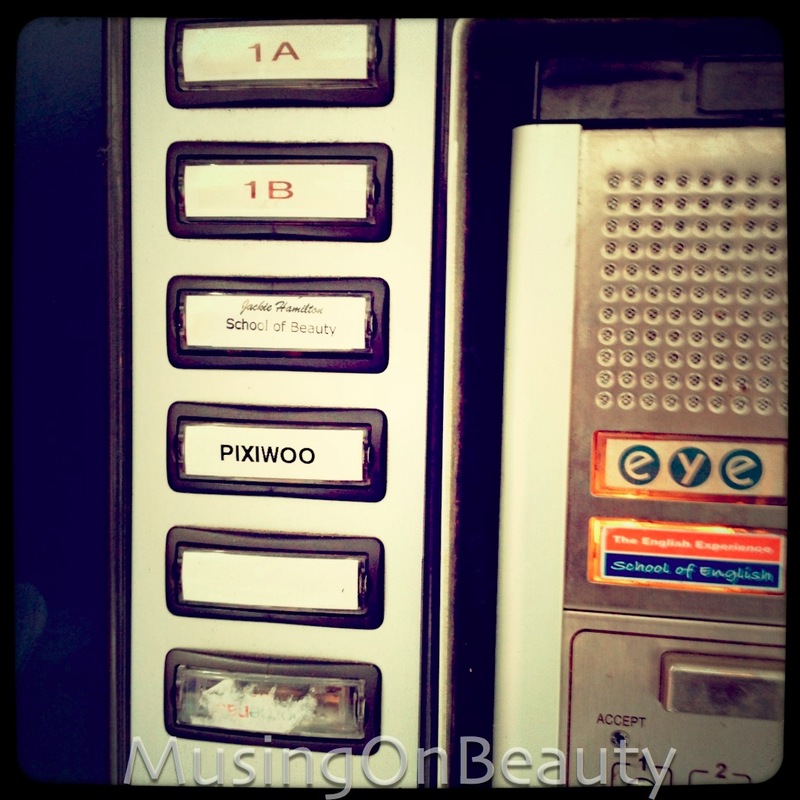 Hi Lynn, you should contact Stacey (at pixiwoo dot com) to aks her for all details. Take into account you need to have accomodation etc as well. How old do you need to be? Great post, very helpful thanks! 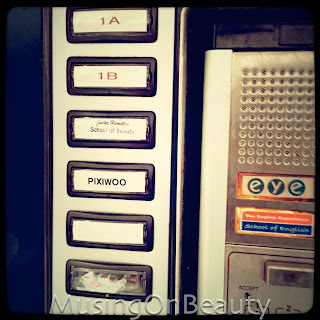 Informative post.. I am sure that you got a best learning experience..
Great post. never found a these type of information anywhere.. thanks for sharing! !